Result: Marin Cilic defeated Nick Kyrgios by 7-6(3), 7-6(4). An absolute and outclass performance was witnessed today between Marin Cilic and Nick Kyrgios in both sets. Nick Kyrgios has hit 82 aces in three matches. Marin Cilic has held serve 33 of 34 games. 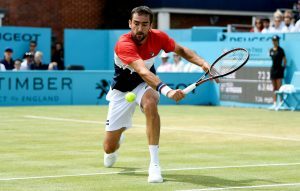 The 29-year old Marin Cilic took the lead in the opening set of the match. However, Nick Kyrgios was also scoring points at a very fast pace. After a tough battle the match eventually came to a tie-breaker as the score were levelled at 6-6. Marin Cilic finally won the set on the tie-break after some brilliant forehand and backhand shots. 🙌 Marin Cilic is through to a third final at Queen’s Club after beating Nick Kyrgios in straight sets. The match moved on to the second set and this time Nick Kyrgios opened the scoring. Both the players again gave an outstanding performance which led the set again to a tie-breaker. 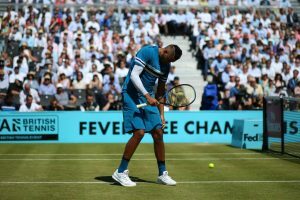 At last, Nick Kyrgios again lost after he failed to score the last two points on his serve. Result: Novak Djokovic defeated Jeremy Chardy by 7-6(5), 6-4. The Serbian star, Novak Djokovic opened the scoring of the first set and was playing confidently. However, on the other hand, Jeremy Chardy started scoring and soon the match came to a tie-breaker. Novak Djokovic barely won the match on the tie-break as Jeremy Chardy lost two points on the serve as compared to Novak who lost only one. The match moved on to the next set and Jeremy took the lead. Novak Djokovic not only recovered the lead instead he won the match when Jeremy Chardy lost the last point on his serve. Novak Djokovic has booked his place in the final at Queen’s! 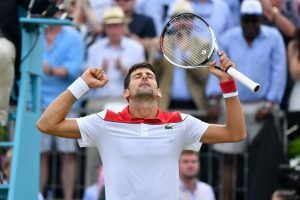 Novak Djokovic booked his place into the final of Queen’s Club Championships 2018 where he will face the Croatian, Marin Cilic. With today’s victory @DjokerNole ties Stefan Edberg for 9th on the ATP’s all-time Open Era win list! Result: Bruno Soares and Jamie Murray defeated Oliver Marach and Mate Pavic by 6-3, 6-7(8), 10-7. Bruno Soares and Jamie Murray opened the scoring of the first and kept on extending their lead at a very fast pace. However, Oliver Marach and Mate Pavic struggled hard but they were only able to recover some points and eventually lost the first set. The next set started and this time Oliver Marach and Mate Pavic took the lead. Both the pairs performed at their peak in this set as it finally came to a tie-breaker. Bruno Soares and Jamie Murray failed to win this set as they lost the last point on their serve. 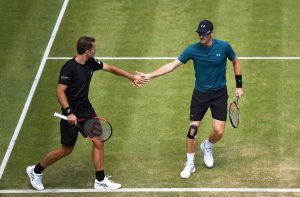 Jamie Murray & Bruno Soares are taken into a decider by Oliver Marach & Mate Pavic who win a second set tie break (8-6) at Queen’s, live on BBC red button. Now it was all down to the third set for both the pairs. Although, Bruno and Jamie took the lead in this set but their opponents were also recovering the points quickly. At last, Oliver Marach and Mate Pavic faced defeat in the last set and did not make it to the finals. Jamie Murray & Bruno Soares beat Oliver Marach & Mate Pavic 6-3 6(6)-7 10-7 at Queen’s to make the final. Bruno Soares and Jamie Murray will now face Henri Kontinen and John Peers in the final of Queen’s Club Championships 2018. Do join allsportspk to see the highlights of the final of Queen’s Club Championships 2018.